A great turn out by the RN/ RNSA windsurfers. Lei A Parsons first ever race experience in the master blaster. Harry Keenan debut on the national circuit, using some of the superb new RN kit. Dave Strudwick hoping to go one place better than his runner up position in the 2018 amateur fleet championship. Gerry Northwood returning to the UK and getting used to the colder waters after a winter training in Maui! Gavin Nicholson praying for the lighter winds to go foil racing. Sunny with virtually no wind, Saturday was a perfect day to do what windsurfers do best... Stand around, wait for wind, admire new kit, catch up with friends, offer 'more down-haul' rigging advice and generally talk a good game. Credit the master blasters who still raced around a bouy and back. Sunday was looking promising with a 20 knot easterly forecast. With an hour less in bed and a early start to catch the wind, it all started very well with powered up conditions. Unfortunately as the sun broke through and the temperature increased, a local thermal effect kicked in and made for tricky conditions. After a few false starts, the wind at 8-15 knots was not consistent enough to complete a full slalom race. After lunch the UKWA ran a series of wind foiling races. A new experience for many as the fleet grew from 6 last year to 22 this year. The next UKWA event is 27/28 April, (close to HMS Sultan & Collingwood) at Lee-on-the-Solent sailing club. 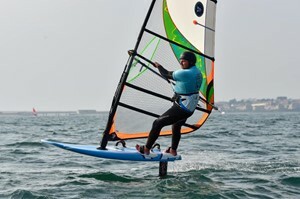 With the purchase of new RN boards, sails and foils there has never been a better time to try racing or hydro foiling. If you are interested in giving it a go? There is racing for all levels from start course to pro sailor. For more info please get in touch with one of the team.